The RFJ-6HD 2.7-mt. "Low Rider" Garage Floor Jack is a true heavy lifter. With a 2.7-mt. lifting capacity, quick-pump design, durable heavy steel construction and emergency overload system for increased safety, the RFJ-6HD is the jack to wheel out when working under a hefty ground-hugger. With a raised height of 533 mm, you’ll see and feel the difference between a Ranger floor jack and… well, anything else! 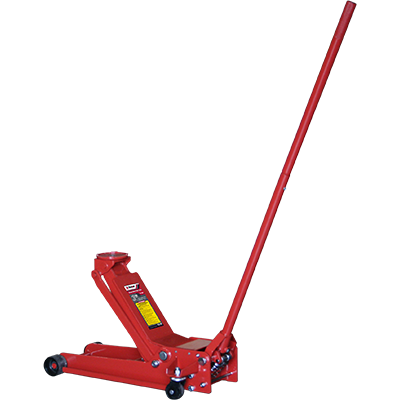 While many jack stands are capable of raising vehicles over 508 mm, many floor jacks fall short of this height. It’s disappointing to get a nice jack stand that you can’t get the most out of because of limitations from the floor jack. The RFJ-6HD gets more out of your equipment by offering an increased lifting height that doesn’t compromise your safety. Simply put, Ranger’s floor jack goals are to lift you higher, keep you safer and get the job done faster. Plus, our safety testing is second-to-none in this industry. The Ranger brand truly stands for excellence in the auto service field. We’re proud to say that the RFJ-6HD is one powerful, user-friendly jack! The extended handle gives you all the leverage in the world to make a few quick, effortless pumps and get your vehicle in the air in no time. This model is designed for heavy use: two floor jacks operating together can lift a 5,443 kg vehicle, so it’s nothing new to us when professionals around the world tell us that when they use a floor jack, they recognise and trust the Ranger name more than any other brand.